It's the holiday season, and the deals are falling at crazy rates. Here is our curated list of the best Android Apps and Games on sale for Christmas 2016. Moon+ Reader Pro - Rs. 170 - Very good epub and PDF reader, with a lot of customization options, Google Drive, Dropbox Sync and more. Nova Launcher Prime - Rs. 10 – The king of launchers, now with features from the Pixel launcher. Rocket Player Premium Audio - Rs. 10. A good audio player with lot of customization, themes and a powerful equalizer. Sikebo Icon Packs - Rs. 40 each (thousands of icons in each). Great collection of icon packs for Nova Launcher, and other 3rd party launchers.My picks are IMMATERIALIS, BELUK, RETRORIKA, and MATERIALISTIK. ANTIMO and SIMPAX are newer and look good too. Tapet - Rs. 65 premium unlock IAP. Wallpaper generator with a lot of patterns to choose from. Bloons TD 5 – Rs. 65 – Best tower defense game for Android. Deus Ex GO - Puzzle Challenge - Rs. 120 – The newest entrant to the GO series, it is very different, but is not on par with the other two. Don't Starve: Pocket Edition - Rs. 200. A well made survival game. Downwell - Rs. 65. Read our previous coverage for more details. Geometry Dash – Rs. 40. Really tough platformer, with a brilliant soundtrack. Hitman GO - Rs. 60. Silent Assassin, turn based style. A very good puzzler. Hitman Sniper - Rs. 10. Can’t complain for the price. Kingdom Rush Frontiers – Rs. 65. Very good tower defense game with RPG-like elements. Kingdom Rush Origins – Rs. 65. Similar to the one above. Lara Croft GO - Rs. 60. Don’t know whey they didn’t name it Tomb Raider GO. Superb puzzler. Leo's Fortune - Rs. 100 A very good platformer. Limbo – Rs. 10. One of the finest indie games ever made. Need for Speed Most Wanted - Rs. 10. Vroom vroom. Reigns - Rs. 65. Rule with a swipe. Riptide GP: Renegade – Rs. 65. Threequel to the popular jetski racing game. 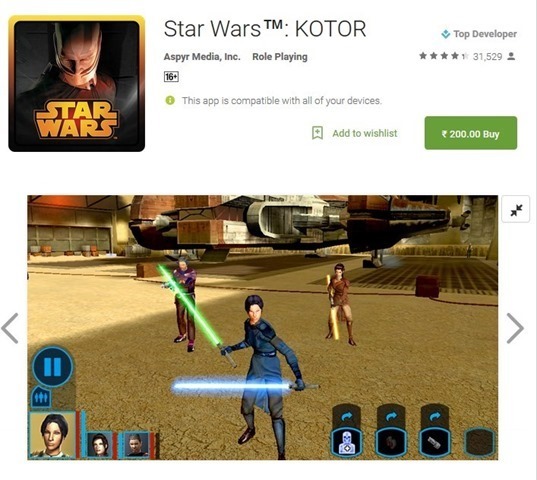 Star Wars: KOTOR - Rs. 200. Full port of the PC game. An excellent game, but takes a ton of storage space though. (Free on Amazon Underground). Star Traders RPG Elite – Rs. 65. 4X game with a Space theme. The list does not include apps and games which have lot of bugs, or paywalls (unavoidable IAPs). If you want to recommend any app, icon pack, or game, drop a comment and let us know, and we will consider including them in the list. Expect more Google Play deals around Christmas Day, Boxing Day and New Year’s Day. Android Apps and Games sale Christmas 2016. Google Play Year End Sale.